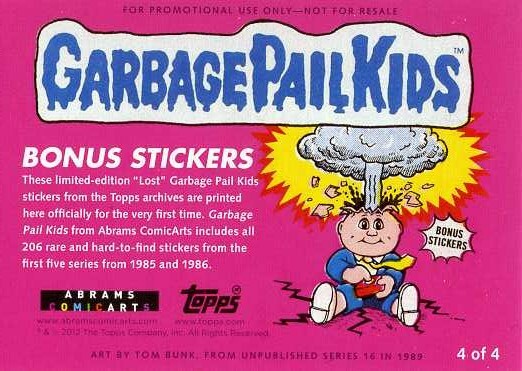 The Garbage Pail Kids book from Abrams Comic Arts and Topps traces the origins or the hobby icons with plenty of pictures, some historical info from the creative frontlines and even some new stickers. 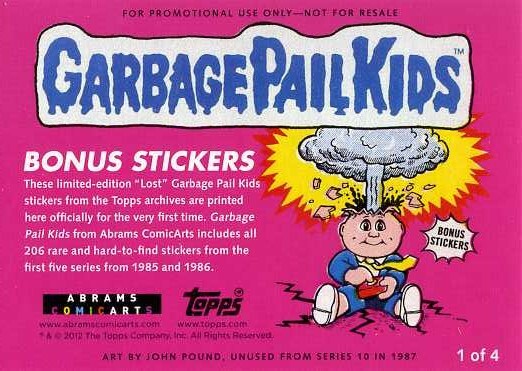 When Topps debuted Garbage Pail Kids in 1985, they became an instant cultural icon. 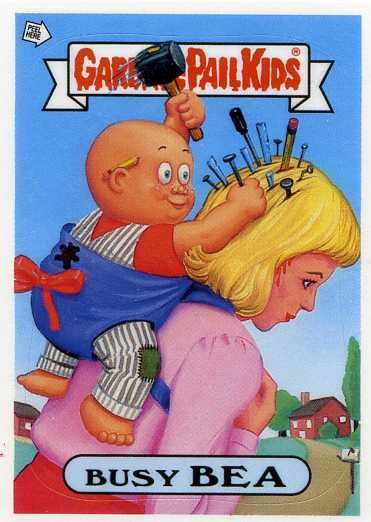 The gross-out sticker cards played off the popularity of Cabbage Patch Kids, adding layers of nasty sight gags that often involved vomit, severed body parts and other forms of self-induced torture. Straddling the fence between cute and offensive, they were a hit among school-aged kids and the bane of many teachers and parents.
. There was also a cartoon that never aired in the United States but has since surfaced thanks to DVD. The franchise was revived in 2003 with several releases under the banner "All-New Series." Topps has even gone back to the original cards to create three Flashback series, the most recent of which came out in late-2011. 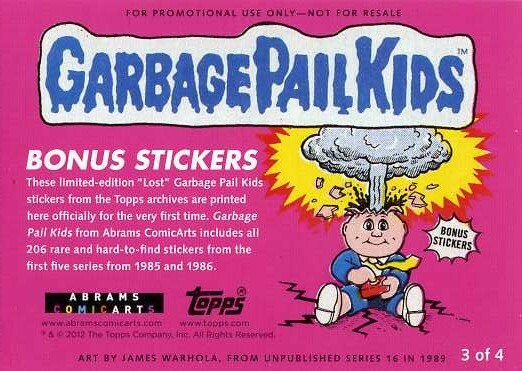 Abrams ComicArts and Topps have partnered to publish a fantastic book that celebrates and catalogs the first five original Garbage Pail Kids sets. 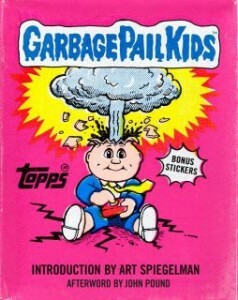 From the outside, the delightfully designed hardcover mimics a Series 1 pack, complete with hot pink, wax-based paper and Adam Bomb, the most iconic of all the Garbage Pail Kids. The only thing missing is a stick of gum, although the last page in the volume is card-gum pink. 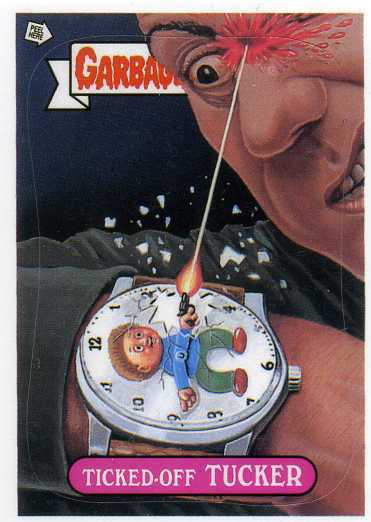 Most of the Garbage Pail Kids book's interior is dedicated to printing high-resolution pictures of all 206 Series 1 through 5 sticker cards. The bottom of each page also lists the matching variant "B" names. Those who recognize the name Art Spiegelman will likely know him from his work in comics and graphic novels, most notably the ground-breaking Maus. 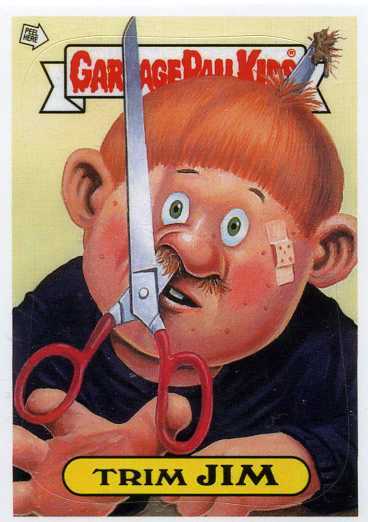 Card collectors may not know he also had a major role in the creation of Garbage Pail Kids. Spiegelman writes a five-page introduction for the book, offering an abbreviated history of how the stickers came together. Coming from the inside, his insights presents a rare look for collectors who may have carted their stash of contraband Garbage Pail Kids around in their pockets, trading in the shadows of the jungle gym. John Pound, one of the original artists, writes a two-page afterward that runs through the original run's history from his perspective. 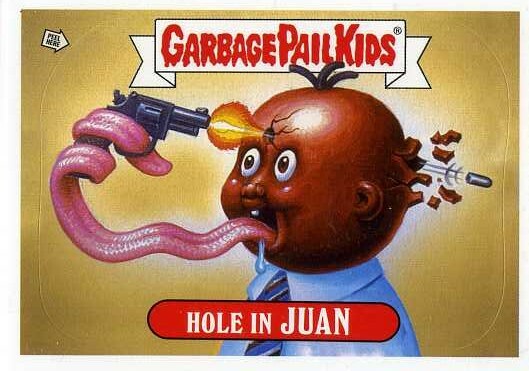 Both Spiegelman and Pound pay tribute with their honesty about Garbage Pail Kids' place, not only in hobby history, but 1980s pop culture history as well.
. It's a fun read and a fast trip back to when trading cards had true punk rock superstars. I'm hoping there's more to come from Abrams and Topps. Two more similar volumes and perhaps one for oddball Garbage Pail Kid releases would fill out the series very nicely. 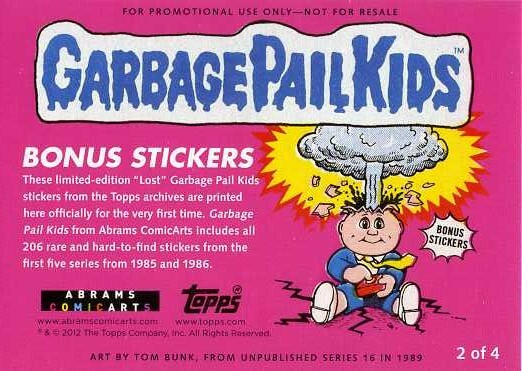 12 - 1986 TOPPS GARBAGE PAIL KIDS SERIES 4 RACK PACKS IN BOX CARDS LOOK MINT !